Laser-induced graphene, or LIG in short, is a flaky foam of carbon that measures only one atom thick. It possesses a number of interesting characteristics on its own, but as part of a composite, it is also capable of gaining new powers. A batch of LIG composites has been reported in the American Chemical Society journal ACS Nano by the lab of chemist James Tour at Rice University and the lab of professor Christopher Arnusch at the Ben-Gurion University of the Negev in Israel, putting the capabilities of the material into more sturdy packages. The labs infused the LIG with wax, cement, rubber, plastic, or other materials and successfully created composites that offer a wide variety of potential uses. 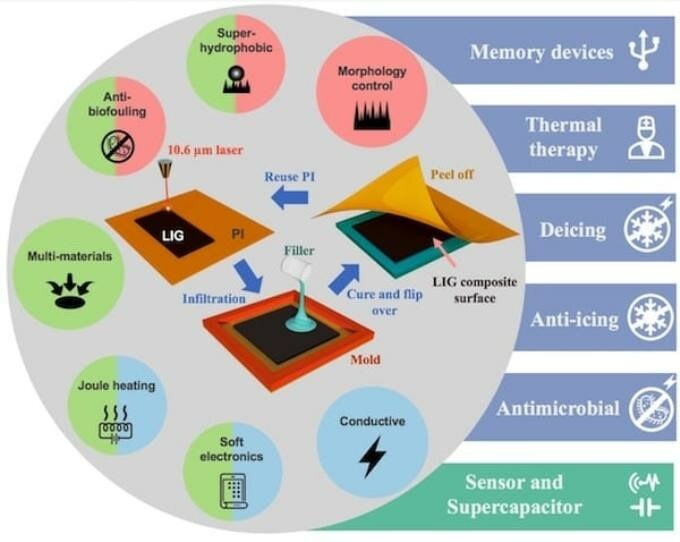 Such novel composites can possibly be employed in heat therapy, in wearable electronics, in anti-icing and deicing work, in water treatment, in producing antimicrobial surfaces, and also in developing resistive random-access memory devices. LIG was first developed by the Tour lab in 2014 when a commercial laser was used by it for burning the surface of a thin sheet of polyimide—a common plastic. The heat of the laser caused a sliver of the material to turn into interconnected graphene flakes. Compared to the conventional chemical vapor deposition, the one-step process was able to make much more of the material and also at a relatively lower cost. Ever since then, the Rice lab researchers and others have extended their analyses of LIG, even dropping the plastic in the process to produce it with food and wood. The previous year, the Rice team produced graphene foam for shaping 3D objects. The researchers developed the composites by pouring or hot-pressing a thin layer of the second material on the surface of LIG adhered to polyimide. As soon as the liquid solidified, the polyimide was pulled away from the rear side for reuse and the connected, embedded graphene flakes were left behind. Tour said that it is possible to use soft composites for active electronics in flexible clothing, whereas harder composites make exceptional superhydrophobic or water-repellent materials. Upon applying a voltage, the 20 µm-thick layer of LIG destroys bacteria on the surface, rendering hardened versions of the material suited for antibacterial applications. Composites produced with liquid additives were found to be best at conserving the connectivity of LIG flakes. In the laboratory, these composites heated up rapidly and consistently upon applying a voltage. That aspect could enable the material to be used in various applications, for example, as a flexible heating pad for treating injuries, as an anti-icing or deicing coating, or in garments that heat up as required. You just pour it in, and now you transfer all the beautiful aspects of LIG into a material that's highly robust. James Tour, Chemist, Rice University. Rice graduate students Duy Xuan Luong and Kaichun Yang and former postdoctoral researcher Jongwon Yoon, currently a senior researcher at the Korea Basic Science Institute, are the paper’s co-lead authors. Former Rice postdoctoral researcher Swatantra Singh, now at the Indian Institute of Technology Bombay, and Rice graduate student Tuo Wang are the paper’s co-authors. Tour is the T.T. and W.F. Chao Chair in Chemistry and also a professor of computer science and of materials science and nanoengineering at Rice University. The study was supported by the Air Force Office of Scientific Research and the United States-Israel Binational Science Foundation.